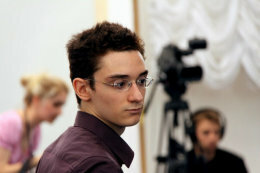 ST. LOUIS, May 12, 2015 /PRNewswire/ — The United States Chess Federation (USCF) today announced that Fabiano Caruana has initiated the application process to change chess federations, which, when approved, will allow him to play for the United States. Fabiano, who has dual citizenship in the United States and Italy, has been playing for the Italian Chess Federation for a number of years. When complete, this change will unite Fabiano Caruana, who is ranked third in the world, with Hikaru Nakamura, the world’s fourth ranked player and Wesley So who is ninth, under the United States flag. Caruana hopes to compete in his first tournament as a United States player on the second leg of the Grand Chess Tour at the Sinquefield Cup in Saint Louis, Missouri. The Grand Chess Tour is a circuit of international events for the world’s best players. The 2015 Tour was created in partnership between the Chess Club and Scholastic Center of Saint Louis (Sinquefield Cup), Tower AS (Norway Chess 2015) and Chess Promotions, Ltd. (London Chess Classic). The United States Chess Federation is a 501(c)(3) charitable organization dedicated to empowering people through chess one move at a time. The USCF serves as the governing body for chess in the United States and represents the United States in world chess events.